Your Florida Tattoo Education - Easy, Online & Affordable! Meet the Department of Health's new education requirement to operate as a licensed tattoo artist in the state of Florida. 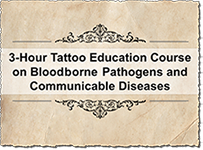 By taking this online bloodborne pathogen & communicable disease course you will satisfy the state's requirement and can apply for your tattoo artist license. We give you all the information you need to apply for your tattoo license. Simply register, complete 3 hours of easy course material, pass the final exam and you can instantly download your proof of completion for free! This is what you will need to apply for a license or show (for guest tattoo artists) that you have met state requirements. The online tattoo education course is compatible on any device! We have a secure, mobile-friendly registration that allows you to sign up and complete the course wherever you have internet connection. Learn more about how to apply for your license and meet state requirements. 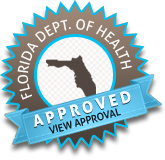 "Florida Online Tattoo License" is a servicemark of American Safety Council, Inc.